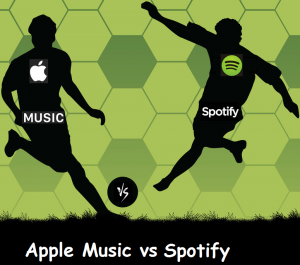 People are spoilt for choice when is come to choosing between Apple Music and Spotify. Major players have been competing with independent operators, for the past few years… Apple Music and Spotify are definitely not the ones to be left out. It’s easy to get lost in the detail of which services other music streaming services offer. The truth is, they all offer the same kind of services, but differ on other features. Which is why we want to compare between Apple Music and Spotify, which streaming music services deserve your monthly subscription. It is almost 2 years since Apple Music was launched and so far it is touting how amazing it is to use. With massive marketing campaigns and several celebrities lined up, they are confident about the streaming services and people are willing to subscribe to monthly or family plans. Currently, Spotify is leading the space in terms of paid subscribers. However, Spotify has been facing issues. It is getting criticized for not paying artist enough money, with artists like Taylor Swift withdrawing her songs from Spotify and others soon following suit. Spotify has a huge amount of music that subscriber can listen to and other amazing features. What is the price difference of both streaming services? Both Apple Music and Spotify cost $9.99 a month and offer a family plan offer for $14.99 a month. Only 6 subscribers are allowed to use the family plan for both Spotify and Apple Music streaming services. Both services claim to offer over 30 million songs on their platforms, but depending on where you live, access to songs sometimes differs. For instance, US and UK subscribers get different streaming services than a user in Sweden. The services they offer are pretty much equal in terms where they can be accessed. Spotify offers mood-based playlist and a comprehensive list of auto-generated radio stations powered by The Echo Nest’s algorithms. Apple Music offers a wide selection of radio stations that play music based on genre, albums, artists and much more. It also offers a 24/7 live radio station called Beats 1 and hosted by different DJ personalities including Julia Adenuga and Ebro Darden. Apple Music appeals to your music preferences. Playlists at Apple Music are curated depending on a particular artist, style or activity like driving and exercising are curated by experts. Spotify has a different playlist compared to Apple Music. It has a playlist-discover feature called Discover Weekly. The curated playlists have 32 base genres to choose from and are updated every Monday. Based on your listening habits, Spotify offers a two-hour of personal music recommendations based on your preferences. Spotify has Spotify Connect, though it’s not as ubiquitous.Spotify Connect works similar to pushing audio to connected speakers. Apple Music support airplay and allow users to send songs from iPad or iPhone to a television or a stereo. You can create your playlist from the songs available or choose a curated playlist to listen to on both streaming services. After a three-month trial, Apple Music requires subscribers to pay a monthly fee of $9.99 per account and $14.99 for a family plan. After paying, both options on both streaming services do not make users listen to adverts. Different from Apple Music, Spotify has a free tier option that is ad supported. However, once you upgrade to their premium option, you will not listen to any ads.It’s a non-ad-supported tier. Spotify and Apple Music, both offer different encoding qualities. Spotify offer 96kbps, high 160kbps, and extreme 320kbps while Apple Music has regular 128kbps and high 256kbps encoding quality. If you want to tell the difference between the sound qualities, use audiophiles. It’s the best way you will be able to tell the difference, but Spotify still offers better sound quality than Apple Music. Apple music is available in more than 113 countries on iPod, iPad, and the iPhone as well as Apple Watch 1.0.1 or later. Apple Music is available a variety of devices such as Macs and PCs running iTunes, Apple TV and on Android. Spotify is available on devices such as Android devices, the web, iOS, Fire TV device Amazon Echo and several connect speaker systems. It is available in more than 60 countries. If you are going to choose one of the streaming services to subscribe to, both services are relatively easy to use, fairly priced and widely available. They both come with plenty of options for creating playlists and finding songs and both have basic controls. Depending on your preferences you can choose either of the services.